The following appeared in installments of the Indian Lake Bulletin,in both 1961 and 1965.The author was Laura M. Guenther,the article "Glimpses of Sabael:Its First White Settlers-Their Descendants Living Nearby"
" The most interesting stories about Sabael and the Indian Lake area were told me when I was about ten years old by my great grandmother,Annis Shaw Porter,then widow of Gideon Goodspeed Porter,who had died in February,1884. Grandma was born Annis Shaw,daughter of William Shaw of Bennington,Vermont,in 1821 or 1822. 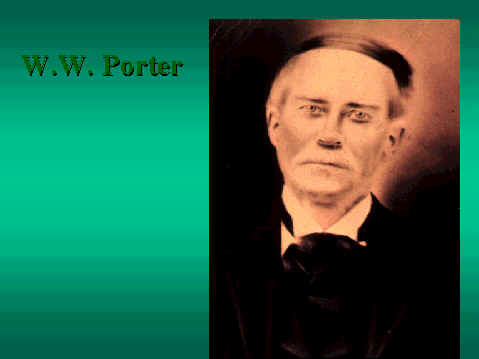 She married Gideon G. Porter in 1838 or 1839,and their son,Martin,was born a year and a half later in 1840. She told me they had come in March,1847,with their two oldest children,Martin and Mary,my mother's mother,then three years old,to carve a future from the vast wilderness,so beautifully described by Warner in his story,"In the Wilderness," [required reading in our school in the early 1900's]. They were accompanied by Grandfather's own and favorite cousin,Willard W. Locke,and his beautiful wife,Marie,and their two oldest children,Willard Jr. and Ellen,who was also three years old. Marie was third cousin to both her husband and Grandpa Porter,through the Goodspeeds. Willard W. and Grandpa were about the same age and Grandpa was born in 1816.The girls they married were a few years younger. Both men had taught school in Bennington,Vt.,but after two years of teaching had decided for a higher education. Both went to Burlington,Vt.,where Grandpa became the protege of a well known group of physicians. He wished very much to be a doctor and studied hard.Willard W. began studying law,very much as Abraham Lincoln was doing about the same time. Money was scarce with both,and Grandpa tutored some of the children of the physicians he was studying under. That small pay for tutoring was all he had to depend on for some time.In order to study any profession in those days,one had to be born wealthy or with a strong urge for knowledge; they would have strength and courage sufficient to carry them onward through difficult times. Plans were carried out and both hewed to a straight line until a year after they started their studies. Both decided to get married to their Bennington girlfriends with whom they had carried on a correspondence as time permitted. From the time they married and took their brides to Burlington,they found it hard to keep going and when they each had two children,it was utterly impossible to continue. Lessons had suffered,through the fathers trying to aid their wives in taking care of the children. Their marks fell,and they found it now took two years of studying to cover the amount of work they had done that first unhampered year. When the two men found time to chat,both now debated if they should leave their families with their parents and go to California,and when they were well settled there to send for them. Or should they go to some other spot where they could get free land,and make a living which they could share with the large fmily each man and his wife planned on having ? Both families were religious,and Grandma told me that many prayers were made that God would direct them to what would be best for all. Fate stepped in just then. Kip Wells of Fort Edward,N.Y.,a lumberman,cousin of Grandma's,looked them up while in Burlington on business and told them of his recent trip to Wellstown in Hamilton County,New York,on a timber scouting mission into the heart of the Adirondacks. He told them about the virgin lumber he and the men who accompanied him had found on this trip. He could not find words to adequately describe the beauty of the wilderness through which they had passed. He felt the most beautiful part of that long hike was Lewey Lake - Jessups River - Indian River ,that started at the merging of Lewey Lake outlet with the Jessups River. Indian River was winding and narrow at times but its clear pools showed more trout than any of them had ever seen before. Deer in herds could be found grazing near any pond or body of water at dusk. All kinds of game were plentiful,particularly wild pigeons,partridges,and rabbits. Kip did not stress the fact that wolves bear,and panther were also seen or heard. He finally persuaded the two young men to accompany him on his next scouting venture during that coming summer. When they finally arrived at Lewey Lake and began their trip by boat down to Indian River,they had seen lots of wild country. Kip had forgotten to tell them that when Indian River had been followed a few miles through marshy,low-lying terrain,they would be coming into a beautiful body of water held back by a wooden dam below a narrow part of the one-time Indian River,to form a lake. When Willard W. and Grandfather first saw a brilliant sunset mirrored in the depths of this small lake the evening they arrived there,and the breaking of a lovely day that following morning,they were sure this was to be their future home territory and told Kip Wells they believed Indian Lake was the appropriate name for this beautiful gem that shone so brightly on the outstretched hand of Nature."